Welcome to Paul's Bikes website and blog. On the site you will find information about the shop, about our service and aftercare as wells as information about our bikes and accessories. You will also be able to find links and news feeds for a few of our favourite sites too. A little bit of history - Paul's Bikes opened in August 2005 on the site of C.J. Frost and Son cycles (which itself started trading in 1953). Having worked at Frost's since 1984 it was a pretty easy decision to take the helm and continue to serve the many customers we had gained over the years. Today's shop - although the bikes and the technology and the way in which we all ride and cycle have changed over the years, our basic philosophy hasn't. Everyone who works here (and our supporting cast) is an avid cyclist: we only sell bikes and gear which we think offer good value for money and will be fit for purpose. That's why people come back to us whatever their cycling ability and whatever their budget. The shop layout featuring some of our Ridgeback and Haro bikes. 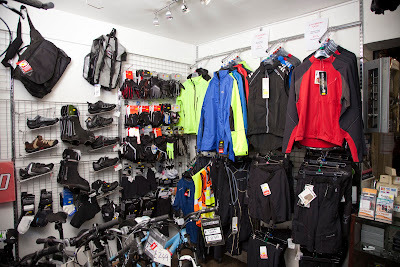 We carry a good selection of clothing, from helmets to shoes and all the bits inbetween. We pride ourselves on providing a high quality service and putting our customers first: we don't compromise on safety or attention to detail. We are the main dealers and authorised service centre for a range of marquee brands such as Ridgeback, Specialized, Brompton, Haro to name but a few. These companies have a choice on who they select, we see this as a mark of our technical skill and knowledge as well as a sign of our reputation as the area's leading cycle shop. 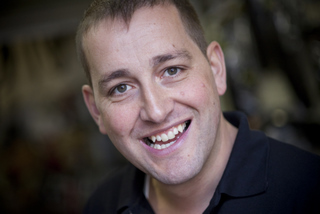 Paul Bullen, owner and manager Paul's Bikes, November 2011. My team and I look forward to seeing you in the shop soon. Shop hours and maps are available here. Images of the shop, the stock and our team courtesy of Ian Miles at Flashpoint Pictures. (C) Paul's Bikes Ltd (2011). All Trademarks are copyright of their respective owners. Simple theme. Powered by Blogger.